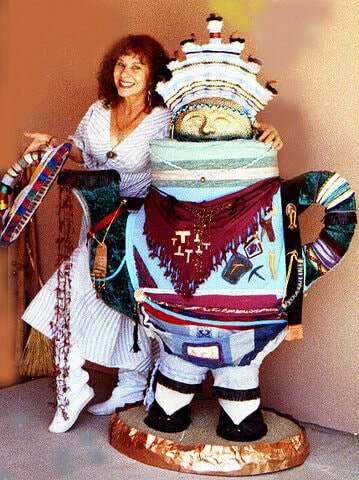 Lisa Bacon with one of her creations, Kachina Teapot. She also designed the dress and jewelry that she is wearing. On June 25, 2014, I had an Out of Body experience in which I visited my mother, Lisa Bacon, on the other side. My mother passed away on the Summer Solstice 2012. My mother was always very supportive of what I do for a living, and loved Dr. Peebles dearly. He came to visit her in spirit before she passed, as did her mother and Jesus. I remember watching her gaze at them with so much love, and she smiled and mouthed to them, "Yes, I am ready." Within 24 hours she made her transition after requesting "water in a pretty glass," consuming it, smiling and saying, "Hooray!" After she passed, I had four out of body visitations with her, but each time she would not let me get close to her or hug her. One time I tried, clinging to her with all my might, and she pulled me off. I did not understand this lack of affection from my usually very affectionate mother. Then I finally understood: if she let me hug her, I would not let go of her, and I would not return to my body. I knew this was true, as I missed her desperately, and having no fear of death I could have easily "gone home" to be with her given half a chance. The video above tells of the fifth out of body experience with her wherein communication with her was established, and the amazing things that were revealed to me about life on the other side. This video was created by Kelly Coltrane-Martinez. For more about Summer's mother, Lisa Bacon, and her artwork, music, and writings, please visit www.lisabacon.com.